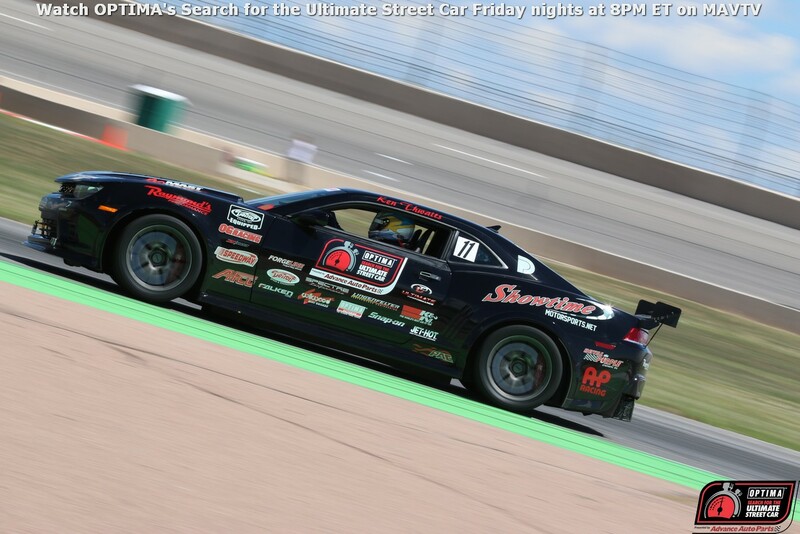 The updated rules for the 2016 season of OPTIMA's Search for the Ultimate Street Car, presented by Advance Auto Parts, have been announced and registration opens December 28th at www.driveoptima.com, but what are competitors signing up for in terms of the way points are scored in 2016? We'll attempt to break down the main differences from 2015 to 2016 here. In basic terms, 500 is the new 125, with 125 points being the "perfect" score during the past two seasons and 500 points being the "perfect" score going forward in 2016. In the Road Rally segment, the points awarded basically go from 25 to 100. There may be points awarded for specific checkpoints at some events, so it may not necessarily be an all or nothing proposition. However, if a competitor cannot complete the Road Rally segment (or any of the other segments), it will be difficult and perhaps impossible to compete for a class win in that event. In the timed events, including the Wilwood Disc Brakes Speed Stop Challenge, the Detroit Speed Autocross and the Falken Tire Road Course Time Trial, the point scale also goes from 25 possible points for a win to 100 points. However, the points now cascade differently after first place, with each finishing position receiving one point less than the position ahead of it. Points also now cascade all the way to 75th place (the maximum number of points entries for a weekend), with finishing positions in classes being determined after overall points are tallied for all the segments. In the Lingenfelter Design Engineering Challenge, points now also cascade from top to bottom by one point per position, starting at 100 points for first place. In the past, a minimum number of points were typically awarded in this segment, provided vehicles had basic components found on typical street cars- working headlights, horn, carpeting, etc... Because more than half of the points awarded in this event were objective, most competitors earned at least 15 points in the event. However, because a portion of this event was also based on subjective judging, it meant that the chances of being awarded all 25 points were very slim. In fact, it didn't happen at all in 2015. The same mix of objective subjective elements will still be present and scored the same way in 2016, but those finishing positions will now be transferred to a 100-point scale. When comparing the finishing positions in the Lingenfelter Design Engineering Challenge to that of timed events in the previous scoring system, it meant that vehicles that finished lower in the judging scored far more points, than they would have if they had finished in a similar position in the timed events. It also meant that vehicles finishing at the very top in the Lingenfelter Design Engineering Challenge did not see as much of a benefit as those vehicles that finished in similar positions in timed events. To illustrate this in points, in the previous scoring system, first place in a timed event was worth 25 points, whereas the most points awarded in the Lingenfelter Design Engineering Challenge at any of the qualifying events in 2015 was 23.4 points. At the other end of the spectrum, most competitors typically received at least 15 points in the Lingenfelter Design Engineering Challenge (most were in the range of 16-19 points), while any competitors finishing lower than 6th in a timed event received fewer than 15 points in their class. A gap of less than ten points in the Lingenfelter Design Engineering Challenge for the entire field obviously did not evenly reflect the gap in points present in most classes for the timed segments. Similarly, in the previous points system, competitors running slower times on the track often received more points than competitors running faster times, simply because of the class they ran in. For example, the last-place finisher in the autocross in the GTS class at a given event had a best pass of 55 seconds and received 18 points for 11th-place in their class. The last-place finisher in the GTL class at that same event had a best pass of less than 52 seconds, but only received 15.96 points, because they finished in 16th place in their class. The difference in points was the result of a larger and faster field in GTL. Additionally, a competitor in the GT class that finished in 16th place posted a faster time than both of those competitors, but also received the same amount of points as the GTL competitor and fewer points than the GTS competitor, because of the class they ran in. Finally, the 16th-place GTV competitor at that event had a faster time than all three of the competitors previously-mentioned, but also received the same amount of points as the other 16th-place class finishers and fewer points than the last-place GTS competitor. At the end of the season, all of those competitors were vying for invitations to the OUSCI, based on points they accumulated during the regular season and those who ran in events with smaller classes stood to gain more than those who ran in larger classes. If this all seems confusing and leaving someone wondering if the new points system will help or hurt them, here are some general statements that can be made about the new system. Keep in mind, these may not always hold true, based on the types of vehicles that enter future events and how they perform at those events. In general, the top competitors with well-built, well-driven vehicles will still be the top competitors. This system should provide scoring that represents each segment equally and rewards well-rounded vehicles, that perform well in all segments. After all, OPTIMA's search isn't just for the ultimate autocross car or the ultimate show car. We're searching for the Ultimate Street Car as defined by those two segments and all the others and we hope to see you in 2016!